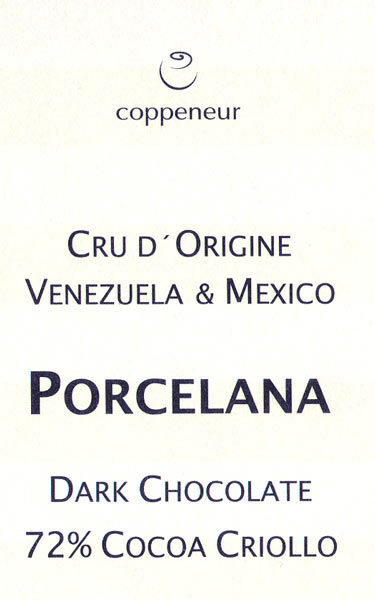 If Porcelana is the Holy Grail of Cacáo, then this Oh Lord - oooooohhh this - is the chocolate communion wafer melting thru the imaginarium of dreams. Almost all Venezuelan Porcelana come from the same source around Lake Maracaibo (excepting perhaps Domori’s), allowing for comparisons to be drawn between the manufacturers' differing styles with this revered relic, given that pre- & post-harvest cycles are virtually equalized. And few if any beans receive the love & attention as these. And yet this still remains peaceful, just missing that exhilarating friction of war, so it won't grab front page headlines because 'if it doesn't bleed, it doesn't lead'. That's the beauty of it. Plus, an ulta-finessed conche - slow shear – produces an overall ponderous nature of low 'wow' but huge 'IT' factors - a purebred exceedingly comfortable in its own skin, very aware of its DNA. If you want splattering blood & guts, plenty of options are out there. If on the other hand you're always yammering 'keep it real', seeking what's true & just - look no further because this is super F-I-N-E to literally, in Shakespeare's words, kiss the image of a dream.